View topic - Flash Carts and Adapters - Forums - SMS Power! 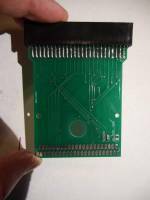 A friend and I have been working very hard to bring the sms community cheap and easy to make single game flash carts. So far our prototypes are ready and were finalizing the code for the FPGA. We plan on selling these boards soon as we'll as taking requests to burn roms you give us onto them so you guys don't have to worry about burning your own homebrews, they'll be ready for you right when you get them! Yes currently the flash size is 8 MB using a 5v MX29F800CTT chip, however I'm looking to replace that as it's outdated. It has 512 KB of SRAM which operates at 3.3v I don't know that chip name or part ID off the top of my head. Currently the mapper is set to act like any official Sega mapper with the added support of up to 8 MB + 32 KB SRAM. The mapper cannot see the rest of SRAM past 32 KB or emulate third party mappers like the codemasters chips but, I'm working on the firmware to at least add large SRAM support for homebrewers who for who knows why may need it. The SRAM feature is optional and we'll have even cheaper boards without the feature available. There are two uses for SRAM - memory expansion and game saves. For the latter I think it's not that useful to have so much, except to allow lazy "copy all RAM" saves, and it might be much more compelling to offer an option that doesn't need a battery (at the cost of no emulator compatibility). For the former, do you intend to support the rarer modes where the cartridge RAM occupies the top 16 or 32 KB of address space, leaving the lower 48KB for ROM? Having 512KB of SRAM was more what chip was available rather than picking one that was the appropriate size actually. Cost and availability are what drives what chips will go on the board else I would have picked a 32KB SRAM and 4MB flash chipset. I'm looking into alternatives for SRAM that wont require a battery but wont lose compatibility with emulators. There are some flash alternatives that may work, however I'm not satisfied with the lifespan of those options at the moment. Originally the last 4MB of the total 8MB flash chip was going to be used for cart ram but conflicts with the mapper proved that was not going to work. As of right now the mapper's firmware does support 16KB of cart RAM at the end of the address space and 32KB features are in the works and should be available by launch. Theoretically any official Sega game as long as its original cart does not contain additional processors will work on this board at launch. EDIT: The full 32KB Cart RAM feature has already been implemented, I nearly forgot and had to look back at the firmware. Were going to try and test as many games as possible but as of right now the only confirmed tests by my partner are Sonic The Hedgehog and Phantasy Star with no errors and that was just the prototype run so were hoping for more positive results as the design and software is finalized. No games used the RAM replacement feature, it was in the mapper but unused (as was the bank shift feature). So you may need something custom to test that. However I think supporting the basics should be the first priority. Supporting Sega mapper style paging in slot 0 with the first 1KB fixed, on the other hand, can easily be omitted as almost nothing uses it and it's quite useless. Interesting, I've learned quite a bit from the game im working on so I'm sure making a mapper testing program would be somewhat easy and it would help debug the fpga firmware. I'm pretty certain the ram replacement feature remains, but the bank shift feature was removed. As far as I know the entire slot 0 can be swapped and the first 1k isn't locked. I want to add a few jumpers from the FPGA on the final board before I'm finished just so I can add mappers for multi game carts and codemasters mapper support to the firmware in a later update. But at the moment just working towards official Sega released game support. I'm going to crack the awkward question - Do you guys intend to use Level Shifters for the final boards? Yes and No the board operates correctly without it. The FPGAs IO pins and the Flash ROM chip already operate on the same level as the SMS. However The SRAM though its power subsystem steps the carts power down for it appropriately, it will probably need level shifters for its signal lines. @Flygon, Altera EPM3064 core is in 3.3v but are 5v tolerant on their IO. You are correct. I just kind of pool them into the same name because of how similar they are. People often recognize FPGA as a name for hardware emulation anyways. As far as I know the entire slot 0 can be swapped and the first 1k isn't locked. Slot 0 paging is mostly useless, and it becomes more so if first KB isn't locked. I suggest you remove that feature entirely rather than offering a 'flawed' version of it (as most EverDrive does). Yes it exists, i'm using FRAM (Ramtron) on my boards. One game (only ? ), Space Gun, swap page 0. I am currently looking into FRAM as my partner brought it up last night, so it may be a viable option. If it works for your cart design then I'm more confident in experimenting with it. Thanks for the feedback on the slot 0 page swapping feature. It seems pointless to have it, like you said and few games (like 1 game) use it. Even programming my homebrew the thought of swapping slot 0 seemed pretty dumb. I just ordered some FRAM chips, super happy to have found ones with the same physical and pinout specs as the SRAM chips Im already using. Thanks again for the recommendation. I still have not removed the slot 0 page swapping feature yet from firmware but Ill get to it this weekend and see how it goes. Once again thanks for the recommendations guys, hope to be getting some videos of it all working soon. I'd think pre-programming a game into the cart wouldn't be very legal, unless Sega doesn't care anymore. Not a fan of right angle traces but the release revision of the SMS cart looks pretty good. The SMS to Genesis one could use some work. Any idea on the pricing yet ? A lot of it is prototyping still so some adapters look pretty bare bones. As far as traces go, I select the most efficient set generated by the auto router so I dont have total control over the angles the auto router uses to trace the board out. Pre-programming homebrews onto carts is not illegal at all given the permission of the software developer has been obtained. We will be selling the carts empty however and you can put whatever you want on them. Not saying you should put official roms on a cart but no one is stopping you once you have it. We haven't priced it out yet as we make the process more efficient and with the change to FRAM the boards are going to get smaller and require less parts and therefore the overall costs will go down. Ill update this thread when we have pricing finalized. Ah, I must have missed "homebrew" in the original post. Auto routing is cheating :P.
Be carefull, FRAM are more expansive than the classic SRAM & battery couple. To have a lower cost, use a cheaper (and smaller) CPLD. EPM7032s or 64s (5v) are obsolete nowadays (but can be found in china), Microchip (who bought Atmel few years ago) have ATF15xx series which are fully 5v. Xilinx XL9536XL can be found pretty easily and are cheaper than the others (3.3v, I/O 5v tolerant). With these tiny CPLD add a little 74x30 or 74x133 for the addresses. I know I saw the pricing for them but with it I was able to shrink the board down to a much smaller size as well as save by removing the battery backup parts. It makes the difference and I found the change to FRAM to be worth it. Im currently looking into Atmel alternatives. I personally like the max line of Altera chips and have a good stock of them already from previous projects. I wasn't aware that they had been discontinued until recently, but Ive also not worked on any CPLD/FPGA projects in a few years up until recently with this master system cart project. Without a doubt the first small run will most likely be powered by these CPLDs until I run out of stock here. Thanks for the recommendations though, I'll have to check out both those series of chips. Ive already been recommended to look at some of the Atmel alternatives already so this is more reassurance towards that. Another problem Im running into is the XX29F800 5 volt flash chips seem like they are a dying platform so its time to pick an alternative for that too (or maybe check for something more available in an alternative package at the very least). Its been an interesting project to work on and learn from. Pretty glad I brought it here while Im still doing testing and prototyping so I can get opinions and recommendations from others who have made carts. You can use 29f016. They are cheap. ~1usd on aliexpress.